Hey Andy...never saw that before; now that you're mentioning it it make more sense. Wow! You're right Andy! You have a good pair of eyes!!!! Chow's made??? There is one of the "Jupiter" versions of the set on eBay right now. Lising is for "Unusual Liquor Dispenser". Its out of my price range at $165.00 but I thought someone on here might really be looking for it. I decline to bid, just for the high shipping cost for me ($40 or more). They offer the glasses with Tsing Tao box! A pitty, but I don't wanna pay so much for it.... (now...). 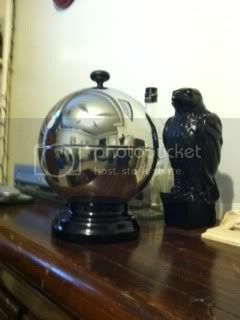 No bidding, $165 Buy It Now: UNUSUAL VINTAGE BOWLING BALL LIQUOR DISPENSER BAR... thinks he's got something totally unique or something. I bought one off eBay a few weeks ago. Might have been me. Been meaning to post pics. When it arrived, the bowler on top had broken off during shipping. He partially refunded me and I kept it anyway. Put a generic black knob from Lowe's on it. I've seen two of dispensers listed on eBay right now that list them as "liquor ketchup pump dispensers"... from two different sellers. Neither have glasses with them. So which one is the screen accurate one? The one on the left I picked up in a thrift store. The one on the right is the one that came with the set I just purchased above. I know the set is from 1955 because it is a bowling trophy and is engraved with the bowling league information. I stand corrected (I looked at my glasses from both dispensers: the open one and the "bowling ball") and it looks like the glass on the right...sorry. I think the one on the left looks more screen accurate too! Hard to tell for sure. I wonder what type of set it was originally part of? We need screen caps here. I seem to recall the band being more centered for some reason. 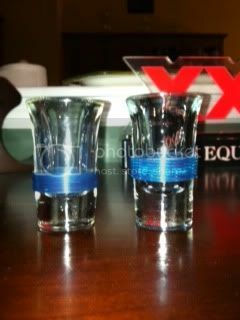 I the one on the left the blue band is almost to the bottom of the inside of the glass. The one on the right it is above it by a bit more and still looks closer to me...especially with the thickness of the band. Because you can't see the bottom of the glass in his hand it makes it look lower, but in the one picture you can tell it is more centered.